Happy New Year! It seems so long ago already, but maybe because I've been so busy melting glass it's taken me this long to share all the new news with you. Firstly thank you to everyone who came and saw me, or bought on line, this Xmas. Its great to see so many people supporting handmade crafts, Covent Garden has such a buzz with people. Of course the next few months are a lot quieter, and much, much colder, so I won't be there every week from now until March. 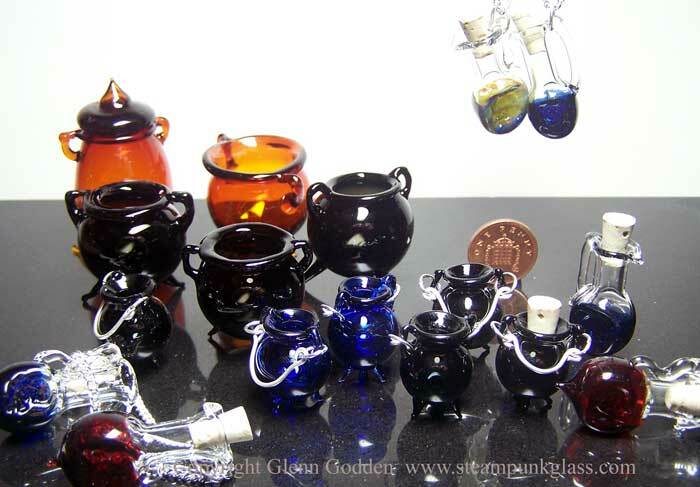 I'll be staying in front of the flame thrower to keep warm and make new glass for you, but do keep an eye on my Facebook page for when I'm next there. The keen eyed (and Swedish speakers) will recognise that translates as 'Witches House' and by coincidence I have been working on a new range of blown glass, base around tiny caldrons. A few of these went into my Etsy shop today, I hope also to extend the range of colours and make some larger ones too, they are quite fun plus like my potion bottles the smaller ones can fit tiny corks to fill them. I've also taken the chance to upgrade and tweak the design of my classic potion bottles, and add a little extra 'evil' to them. I'm now producing a few with a skull and crossbones design pressed into the hot glass. Unlike so many mass produced bottles this means it isn't just a bit of paper stuck on, with coloured dye or paint on the bottle, it won't wear off and adds a textured design to the bottles. A few of these are also going into my shop too. 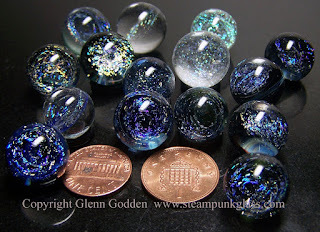 I will also be endeavouring to make more marbles this year, last year I was plagued with shoulder injuries so haven't been able to make as many or any flower marbles due to the awkward angle I need to hold the glass at for these. That's on the mend, so I hope to get back to adding lots of new galaxy and space marbles soon, and already have put quite a selection of micromarbles for the Orion's Belt prop on line. However I may have to hold back on producing more earplugs, as I am still not happy with the way the designs are working, and need to do some serious tweaking to get a process I am happy with, so apologies to all those waiting for various sizes and designs, I'll re-launch those properly once I've got them right in a few months time.